This weekend was one of our busiest wedding cake weeks with our bespoked wedding cakes, being show stopping centre pieces at some absolutely stunning new wedding reception venues. One of these new venues was the Grand Station Wedding & Conference Centre, Wolverhampton. This newly opened venue can cater up to 3000+ guests and wow what an awesome venue this is! 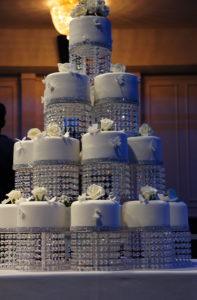 Our beautiful crystal chandelier wedding cake with a lit water fountain in the middle, took centre stage at this crystal themed wedding reception. Another incredible venue and one we often venture to is the New Bingley Hall, Birmingham. Again this large capacity venue saw our 11 tier rose Wedding Cake take the centre stage and quickly becoming the talking point and photograph for next months Asiana wedding magazine. Recently arrived at our Sugarbliss Cake Decorating Supplies Shop are some fabulous new moulds from Alphabet. The barley twist rope mould and the button mould make decorating a wedding cake or celebration cake so much quicker and also creates a professional finish. Other moulds we particularly like is the gem and gone fishing moulds. We also now stock the new glitter number cake decorations. The numbers 0-9 are available in our cake decorating shop as well as the 18, 21, 30, 40, 50 and 60 glitter cake decorating numbers. This week, as most weeks we were very excited to have the new sugar lace mats arrive in our Sugarbliss Cake Decorating Shop, Solihull, West Midlands. We now have a selection of silicone mats, to create sugar laces which are perfect for wedding cakes and celebration cakes. Sugar lace is a brilliant way for cake decorators to decorate cakes, cupcakes and cookies. Extremely flexible, it can also be cut to create ribbons, edges and effect decorations. We suggest using sweet lace paste which gives the lace its edible flexibility. Once the mixture has been spread evenly and smoothly onto the silicone mat, bake in the oven for approx 10 minutes. 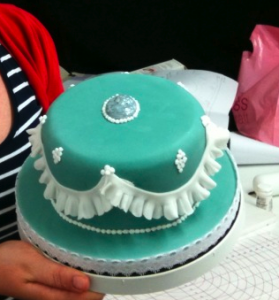 Take the lace out of the mould and simply decorate your cake. Our popular beginners cake decorating class saw some absolutely incredible cake designs completed in last months decorating class. We are sure you will agree, for students who had never decorated or designed cakes before they did a fantastic job and the final cakes looked amazing. This year we have been very busy traveling the country delivering our wedding cakes to many new wedding venues and this weekend, again was no exception. Deep in the country side of Lichfield is the recently newly opened Alrewas Hayes Wedding and conference centre. 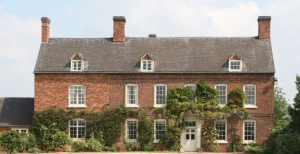 This grade 2 listed Queen Anne residence sits in acres of beautiful rolling fields and can cater for wedding receptions as large as 1500 guests. 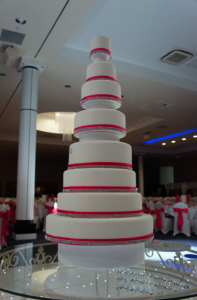 Our up side down frill, 4 tier wedding cake looked wonderful and we are really looking forward visiting this venue again later this month, to delivery one of our crystal chandelier wedding cake designs. We now stock in our Sugarbliss Cake Decorating Shop, Bako 5kg white and ivory sugar paste. This sugarpaste is excellent for covering wedding cakes and celebration cakes and is priced at £12.99 for the white and £13.99 for the ivory. We are sure this newly stocked sugarpaste will be great value to all our cake decorators alike. Another new product recently arrived at our Sugarbliss Cake Decorating Shop, are the eagerly awaited deep blue, round cake drums. Available in 8, 10 and 12 inch, this coloured cake board is a great addition to our existing large range of cake boards.